Classroom instruction motivates children to participate in the Safe Routes to School (SR2S) program through fun activities that encourage them to walk and bike. The lessons teach students how their transportation choices affect their community, the environment, and their health. They also give students a better understanding of their streets and neighborhoods and ensure that they know basic traffic safety. While most parents teach their children some safety skills, it takes time and practice for a child to retain that information. Every school that encourages children to walk and bike must ensure that each child has knowledge of basic safety rules, can identify traffic signs and understands how to behave safely and responsibly. Older children should be taught bicycle skills including basic traffic laws, proper equipment, and how to control a bicycle. The method of communication with children is as important as the information itself. Teaching through hands-on experiences, including skill-building physical exercises, games that test their knowledge, and workbooks for practicing understanding, will increase retention and develop abilities that are real life skills. Bike Rodeos, Walk and Bike to School Days, and mapping exercises provide opportunities for children to try out their skills. Class projects will teach the health benefits of good exercise as well as the environmental improvements that occur when there are fewer cars on the road. Teachers have a full plate of required lessons and need plenty of notice in order to make time in the classroom schedule for SR2S. Schedule your classroom time early in the school year and try to schedule the entire year at one time. Safety training and related lessons fit nicely into a Physical Education (P.E.) curriculum. If your school does not have a P.E. program then you can make the case that these lessons will help the school meet its P.E. requirements. 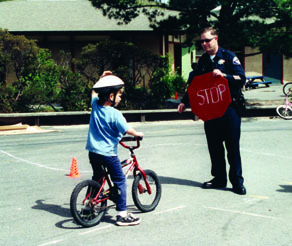 Many law enforcement agencies have special programs that include traffic safety training for children. Check with your local police, sheriff, or highway patrol and see what they have to offer. There also are organizations that specialize in conducting Bicycle Rodeos in schools. They can bring an obstacle course onto campus that simulates traffic situations and provides an entertaining experience for the children. When developing a safety curriculum it is important to identify what children should learn as a result of the training. Pedestrian training programs should ensure that students understand, and practice, basic pedestrian rules. There are many ways to teach safety skills. There are videos available that give children a fun introduction to traffic safety (see Resources). You should always follow a video with an active class discussion. A hands-on exercise will further strengthen the students skills and retention. Make the lessons fun and engaging by presenting the material as a game. Stop, look left, then right, and then left again before entering the roadway from a driveway. Stop or slow down, look left, then right, and then left again before crossing an intersection. Dismount and walk the bike across busy intersections. Always ride your bicycle on the right side of the road, with traffic. Stop for emergency vehicle sirens. Use right and left hand turn signals. Signal to slow and stop. When you walk, run, inline skate, skateboard or ride a bike, stop at the curb or the edge of the street before you cross. Look left, look right, and look left again, turning your head to see over your shoulder, before you step into the street to cross to the other side. Be aware that cars may not stop even if you have the right-of-way. Step into the street only if you do not see any moving cars. Never go for a walk with a stranger. Only walk with someone who your parents say is okay. Walk on the sidewalk or a walking path. When there is no sidewalk, always walk facing traffic. Listen for the sound of car motors, car doors, sirens, and horns before you step into the street. Never run into the street to catch a ball or chase a toy, a friend, or a pet. Never run across the street; walk when crossing the street. Do not cross in the middle of the street unless there is a crosswalk and signal or a crossing guard. Cross at corners and use crosswalks whenever possible; always stay within the lines of the crosswalk. Use intersections with signals and pedestrian buttons whenever possible. Know what the different signs and signals mean and always follow them. Be careful around parked cars; stop, look left, look right, and look left again before stepping out from between parked cars. Early in the morning or in the evening and at night, wear reflective and/or light colored clothing, carry a light, and/or wear a flashing light. Children love to ride their bikes. Cycling gives them a sense of freedom and independence and besides, its a lot of fun. Although each school has its own policy, usually schools dont allow children to bike to school on their own until the third grade. Bicycling is more complicated than walking and requires knowledge of a more sophisticated set of rules and skills. A bicycle safety curriculum should ensure that children have a comprehensive knowledge of traffic safety because, as bicyclists, students have the same responsibilities as drivers to obey traffic laws. Cyclists also should have the right equipment, including a snug-fitting helmet and the right size bike, in proper working order. Braking with the rear brake alone will avoid pitch-over, but it is not very effective. In theory, the fastest stop can be made with the front brake, but only the slightest error will pitch you over. The best system for a fast, safe stop is to use both brakes, which produces the optimum deceleration. If the rear wheel starts to skid, this indicates that you are un-weighting the rear wheel too much. Therefore when the rear wheel skids, ease up slightly on the front brake. Beginning bicyclists need to be given exercises that will help them learn to control their bicycles. Remember that childrens depth, distance and speed perception, as well as their eyesight and hearing, are not fully developed. They need explicit instructions on dealing with traffic, such as not to ride into the path of oncoming vehicles. Bicycle Rodeos are used to teach safety skills while giving the children a fun exercise. They are usually layed out with chalk, traffic cones, stop signs and sponges to designate areas or create obstacles. Sophisticated courses have props of cars and buildings to simulate a street environment. The objective of the Bicycle Safety Rodeo is to teach children the importance of seeing, being seen, and remaining in control at all times when riding a bicycle. This is achieved through a series of bike handling drills and traffic situation simulations. Begin each rodeo with an explanation of what students are expected to demonstrate. Eight different stations give students the opportunity to practice a variety of bike handling skills and procedures for operating a bike safely and legally while in traffic. Each station takes ten minutes to complete, when working with groups of about twelve children. The whole group instruction at the beginning of the rodeo will require a minimum of ten minutes. The children are given a number and instructed to assemble on the black top with the Course Marshal who is holding a sign with their number. The Marshals will ask children to form a row facing the safety courses. Always begin with a Helmet Fit, Bike Fit and ABC Quick Check (bike safety checkup). Wearing a well-fitted helmet and having the right-sized bike in good working order cannot be overemphasized. Instruct the group to check their helmet fit. It must be snug and level with room for no more than two fingers between the straps and the chin. All Course Marshals will look to see that helmets are properly fitted. If a helmet or a bike is not fitting correctly or a bike is not working properly, the child must see a Course Marshal designated to assist with adjustments. Have all students stand over their bikes and explain that they must be able to stand over the top tube with both feet on the ground. Model this with a bike. Explain to the group that this next procedure must be followed every time you ride; its as easy to remember as your ABCs and its quick as well. A is for air, check tire pressure. B is for brakes, check your brakes. C is for cranks, chain and cassette. Make sure the cranks are not loose, the pedals are attached tightly to the cranks, and the chain is on a ring up front and the cassette in the back. Quick is for the quick releases on the wheels and the seat; make sure they are tight. Give specific instructions in the proper procedure for pulling out of a blocked driveway; stopping at the edge, looking left, then right, left again, signaling to the left, then if it is clear, pulling out into the street. Students move on to negotiate four intersections: two left-hand and two right-hand turns, repeating the full procedure at each intersection. The role of extra Course Marshals (possibly played by children who are not participating in the rodeo) is to act as human stop signs at each intersection. They check for compliance with the proper procedure of stop, look left, right, left, signal, and proceed only of its clear. Human stop signs should model the procedure when necessary. Prop cars, motorcycles, pedestrians, and other bikes (portrayed by additional Course Marshals) can move around the course, requiring that children make real decisions about how to react and proceed safely. All Marshals should talk to the riders, offering positive reinforcement and encouraging feedback. The Slalom Course is an exercise in bike handling that is designed to challenge all ability levels while ensuring success for every rider. Instruct the riders that the chalk lines are drawn close enough to make staying within the lines difficult, but that traffic cones are placed far enough apart that any child should be able to navigate the course while remaining between the cones. The Course Marshal will monitor the distance between riders and their speed. Talk to the riders, offering positive and encouraging feedback. Replace cones when they get knocked over. The Turtle Race is a balance exercise. Ask the riders if they find it harder to control their bikes at slower speeds. Most likely, theyll agree. Explain that this is a balance exercise. The last person across the finish line is the winner. Riders cannot put their foot down and must stay within their lane. Talk to the riders, offering positive reinforcement and encouraging feedback. Cheer the riders enthusiastically. The Rock Dodge demonstrates the technique of flicking the front wheel to avoid a sudden obstacle, without swerving wildly. The course is laid out in a circular fashion. The sponges are arranged in a pattern that creates three narrow chutes. Instruct the students to warm up by riding the course and keeping both wheels inside of the sponges when they come to the chutes. After students have done this several times, place the three rock sponges in the center of each chute. Tell students that this simulates a situation riders often encounter; a sudden appearance of obstacle in the riders path, but the rider must stay within a narrow area. Instruct them to steer away from the rock at the last moment, which will cause them to lean in the opposite direction. Counter this by over-steering in the opposite direction. The Quick Turn practices the need to make a quick decision to execute a sharp turn. Instruct the riders to line up and ride through the marked chute toward them, just as the rider reaches the end of the chute, the Course Marshal will direct each rider to turn right or left. Instruct them to ride out to the marker cone and circle back to the line and repeat the drill. Encourage them to build up speed as they become comfortable with the activity. The Chaos Corner demonstrates the need for traffic rules, signals and signage. Designate an area by placing four tall safety cones, which the riders must remain within. The Marshal will allow riders to enter one at a time, the object being to ride chaotically within the confined area without touching another rider. If the Marshal sees riders making contact, they must be removed. Stop the traffic after about 6 or 7 minutes and ask the riders what rules would make the situation less chaotic. Try their ideas. At the end of the station, ask the riders if the new rules helped. The Quick Stop teaches the ability to brake suddenly and maintain control while stopping quickly. Teach the riders to shift their weight back when braking. By transferring their weight to the rear wheel, the rider avoids going over the handlebar, increases the braking power of the rear wheel, and stabilizes the stop. The course involves several lanes of riders taking off at once, with the Marshal positioned near the start. Once the riders have gone past them a short way, the Marshal blows a whistle, signaling the riders to stop immediately. The object is to stop fast, remaining within the lane, even if it results in a skid. This exercise demonstrates the need to be able to respond quickly and maintain control while braking. The Marshal will monitor riders ability to make a sudden stop without veering from their path. Have the riders resume and encourage them to build up speed, then randomly blow the whistle again. Do this several more times as the riders proceed down the lane. Once everybody has had at least one turn, the Marshal will demonstrate shifting your weight back while braking. Explain that this move will make stopping quickly easier and safer because it keeps you from going over the front of the bike, and putting weight on the rear wheel makes it stop faster. The Figure Eight course practices bike handling while challenging riders to use their peripheral vision to adjust their speed. The layout consists of two or more circles drawn on the pavement and outlined with small safety cones. The Marshal will allow each child to ride the course as a warm up. The Marshal will then feed the riders onto the course one at a time, until all the students are on the course at once. Instruct them that they must avoid collisions at each intersection and avoid running into the rider ahead of them. The Marshal will monitor speed and distance between riders. The Nevada State Education Office of Bicycle and Pedestrian Safety provides instructor training for Bicycle Rodeos that includes classroom and field instruction. Classroom time includes direct instruction, discussion, viewing a variety of instructional videos, and a survey of other resources. The course includes a resource binder that contains everything covered in the class, which is an invaluable tool for any instructor. Instructors are taught the rules of safe behavior and the laws that apply to bicyclists and to automobiles while interacting with bikes. They learn how to conduct a bike fit, safety check, and helmet fit. The course includes the fundamentals of child development, which affects the way children behave in traffic and determines how children learn. In the field portion, the instructors have an opportunity to set up several bike rodeo drills and assume the role of student in practicing the maneuvers. This is an excellent hands-on experience that allows instructors the chance to work with a perfected rodeo set-up. The League of American Bicyclists also offers bicycle safety training courses. This lesson introduces children to basic safety skills in preparation for a Walk and Bike to School Day by making signs and banners for the event. Students are asked to demonstrate their knowledge of the basics of safe walking (for first and second graders) and bicycling (for third through fifth graders) and will specifically address dangerous situations such as darting out from between parked cars. This is an opportunity for the teacher to informally assess the level of awareness children have for the traffic situations that are statistically most dangerous. Ask them what they should do to prevent these kinds of crashes. Ask if anyone has participated in a Walk and Bike to School Day. Have a discussion about what the event is about. Further explanation and instructions may be necessary, particularly for first and second graders. Explain that you will be making safety signs to carry on Walk and Bike to School Day (students can make signs to mount on their bikes) and signs to place at staging areas and in front of school. For beginning spellers, best guess spelling is okay, or some words and phrases can be put on the board to be copied. Symbols and pictures are great. As children finish their signs they can bring them to an adult who will attach the sign to a stick or other handle. If your school has a buddy program this is a great activity for older students to do with first and second graders. One way to structure the activity is to have older students write out messages on banners in big (1 to 2 ft. high) bubble letters and then let the first and second graders fill in the letters and paint around them. Your school can decide whether to allow children to take the signs home or collect them and distribute them at staging areas. We have found that collecting the signs at the end of the event and using them again at future Walk and Bike to School days works best. In this activity, students play a game that allows them to practice and develop bicycle and pedestrian safety knowledge. The game is based on the television quiz show, Jeopardy. This activity can be elaborate or simple. The simplest way is to take a piece of paper and write the point value (10, 20, 30 or 40 points) on one side and the question on the other. Use different colored paper for each category. Pin the columns of questions to a bulletin board or tape them to a wall. Break up the class into two teams. Then have the first team pick a category and point value, such as Rules of the Road for 20 points. Read the question and ask the team to give an answer. This lesson is discussion based. Teachers should determine the number of answers a team may give for each question. It is important to elicit the answer from the students and not to give them the answers. Provide hints and prompts, and encourage them to work as a team. Be sure to discuss the reasons behind the answers. When the team has given the correct answer, ask the other team to choose the next question. This game can be played competitively, with a prize or prizes given to the winning team. It can also be done without competition, declaring everyone a winner for knowing his or her safety rules. Q: What side of the street should you walk on when there is no sidewalk? A: You should walk facing oncoming cars (against traffic). Why  It is easier for the drivers to see us. Q: What are the signals for turning right, turning left and slowing down or stopping? A: Left arm up at a right angle for turning right, straight out to turn left and down at the right angle to slow and/or stop. Why  Bicyclists, like drivers, need to alert other users of the road when they will be making a change. Q: True or false: You dont have to stop at a stop sign if you are on a bike and there are no vehicles coming. Why  Bicyclists must obey the same rules as drivers. Even though you dont see a vehicle, that doesnt mean that one wont appear. Q: What is the largest single cause of air pollution in the United States? A: Motor vehicle use is now generally recognized as the source of more air pollution than any other single human activity. Why  Oxides of nitrogen, volatile organic compounds, carbon monoxide and particulate matters are just a few of the noxious pollutants emitted by cars. Talk to the children about traffic safety. Give them examples of poor driving habits, such as speeding, not stopping at stop signs, or not yielding to pedestrians. Give children Traffic Violation ticket forms and have them sit in front of the school during morning drop-off or afternoon pick-up. This exercise can also be done while children are walking to school. Tell students to record traffic violations on their tickets with the license number, the time of day, and the nature of the violation. Hold another classroom discussion to talk about the violations and how they might have been avoided. Discuss where to place posters and when to send letters to parents asking them to drive more carefully. This is a simple exercise that can be performed by students as young as the second grade. The purpose is to determine how children currently get to school. Repeat this exercise at the end of the school year. Use the same format each time or it will be impossible to accurately compare the results. For best results, conduct these surveys during an entire week and then average the results. This exercise should be used as part of collecting baseline information on school travel modes for your Safe Routes to School teams. Have students go to each class and ask students how they got to school that day through a raise of hands. All answers should be marked down on the Student Survey School Travel Form (see Resources). Ask how many children walked and mark it down. Ask how many children biked. Ask how many children rode the bus. Ask how many children carpooled  define a carpool as two or more families where parents share driving. Ask how many children came alone or with siblings in a car. Ask how many children came some other way (i.e., skateboard or scooter). Students then use the results of their survey to calculate how many children in the school came to school by each mode. Create a bar graph or pie chart to show how the students get to school and display it prominently where everyone can see it. At the end of the school year, repeat the survey. Create a new bar graph or pie chart that compares the numbers from the beginning of the year with the end of the year. These surveys will discover more than simply how children get to school. The purpose of this survey is to measure attitudes and feelings. Have students create a survey that asks how they get to and from school. Help the students develop further questions about their attitudes toward driving, biking, walking and transit. What influences their choices? Do they feel that biking is only for kids? Do they think riding in a car makes them more mature? Are they aware of the environmental consequences of their choices? Use a computer database to collect the information. Publish the results in a newsletter. Determine where cars enter the school. If there is more than one entry, determine how many entries there are. Put two students at each entry. Start counting cars a half hour before school begins. Have students record the location, the date, the weather conditions and the start and end times of the traffic counts. Have one student record the number of cars passing the school in each direction. Have the second student count the number of cars that drop off students at school. Calculate the number of cars that pass the school and the number of cars that drop off students. Create a bar graph to show how the students get to school and display it promi- nently where everyone can see it. Make a school wide pledge to walk and bike more often. At the end of the school year, repeat the exer - cise. See if the SR2S program has reduced the amount of traffic passing the schools and the number of cars dropping off students. Hold a celebration to honor the students success. Have a class discussion on how to reduce traffic by switching to alternative modes of transportation. Count only the number of cars dropping off students at school. Count the number of students in each car. Count the number of children walking and biking. Count the number of bikes in the bike rack. Write down the odometer reading when the gas tank is full. The next time the gas tank is filled, write down the odometer reading again and how many gallons of gas it took to fill the tank. Subtract the first odometer reading from the second odometer reading to calculate the number of miles traveled between the two fill-ups. Divide the number of miles traveled by the number of gallons of gas used. This is the gas mileage of your familys car. Calculate the amount of money your family spends on gas by multiplying the number of gallons in your tank by the current price per gallon. Now multiply that by the number of times a year the family fills up the cars tank. Find out other costs of driving, such as oil, maintenance, and insurance and add those in. This family activity is done over the course of a week. Ask your students to keep track of their familys automobile trips. A trip is measured from one point A to point B. If the children are driven to school on the way to work, the first trip is from home to the school. The second trip is from the school to the workplace. If you go shopping on the way home from work, the first trip is from the workplace to where you shop. The second trip is from the shop to your home. Create a chart that allows children to record the date of the trip, the origin, destination and miles for each trip. At the end of the week, count the number of trips that were made. Count the number of miles that were driven. Have a class discussion on alternatives to driving. Can any of these trips be made by transit, walking, biking, or carpooling? Calculate the amount of pollution generated by the family per week. Have students keep their own diary of the trips that they make personally. Create a class chart and calculate the number of trips for the whole class. Discuss ways to reduce the number of trips. ExampleStudents could walk or bike to a friends house, arrange carpools for soccer practice, or walk or bike to school more often. Set a goal for the class with each student making his or her personal goal. Do a second diary for another week. Compare the results to the first week. How many trips were reduced? How much pollution was saved as a result? Use this as a classroom contest where the class that saves the most trips wins a prize. In this activity, students will create a map of their route to school and indicate how they travel to school. It is best to coordinate this activity with the Safe Routes to School Task Force mapping process. As an in-class activity it is useful to have a local area map. This can be copied to a transparency for use with an overhead projector. Children can do this in class or take the activity home. Enlarge a section of a local map, with the school at the center, including the neighborhoods around the school for at least a two-mile radius. Transfer this to an overhead, if any in-class instructions are required. Make copies of the handout with the map on one side. Ask students to trace their route to school using a colored pen or pencil (a yellow felt pen works the best). They may have more than one route if they drive some days and walk or ride some days. Use different colors for each route and create a key. Ask the class to share some of the reasons they cant walk or ride to school and brainstorm possible solutions. Discuss some of the problems they experience along the waybarking dogs, speeding cars, no sidewalks. Tell them to mark any dangerous spots on their map. Encourage them to be creative, draw pictures, or otherwise decorate their map. Pass out maps for children to take home. Ask them to walk the route with a parent or with a friend. Have them use the Safe Route Checklist (See Resources) to identify areas dangerous for walking and bicycling, such as busy streets with lots of cars, fast cars, dangerous intersections, missing sidewalks, and other scary places. Mark those areas in red. Use green to mark places that are safe, such as crossing guards, traffic lights, or quiet streets. Transfer this information to the larger class map. Have the students determine the safest routes to school. Invite the students to present their findings at a SR2S Task Force meeting. Involve them in the efforts to determine safety improvements. Ask the students to draw their own map. Place an enlargement of a neighborhood map on the wall or overhead projector. Tell the students to draw their own version of this map. Then ask them to locate their home and draw it in. Then ask them to locate the school and draw that in. Now have them show their routes to school. Tell them to draw in any landmarks: a friends house, a public building, a favorite tree. Next ask them to draw in any dangerous or scary things that they encounter on their way to school. Display the maps around the school. Horndean Community School in Hampshire, England, developed a geography/information technology class for 13-14 year olds. Students used computers to map the local area, with the help of software supplied by the county. They identified danger points on the way to school, looked at the alternatives and experimented with changes in road design. Through the work, they were able to put transportation issues into a local context, examine problems and come up with solutions. Distribute the list to the children and designate a completion date. Children will use the list as they walk to school. They must identify each item and where they found it on their list. Have a discussion on what they learned from the treasure hunt. When all entries are in, you can draw for a prize or you can reward the child who completes his or her list first. Place a map of the United States on the wall. Distribute a travel diary form for students to track the number of times they walk and bike to and from school. Make sure the form includes the number of miles between the students home and school. Once a week, the students will multiply the number of times they walked to school and from school by the number of miles from their home to school. Add all of the students miles together and translate it into miles using the maps scale. Take a string and cut it to the length of the miles traveled (use the scale on the map). Pin one end of the string on the point of the map where the school is located. Now stretch the string out and see where the students can go. Then decide as a class where they will go this week. Research that town and find out something interesting about the place. Using the Internet, locate a school in that town and communicate via e-mail with another class. Tell them what you are doing and survey them about how they come to school. Decide as a class where their next destination will be and estimate how long it will take to get there. At the end of a month, see how far the class has gone. Discuss how walking and biking can get you to where you want to goeven long distances. This exercise can be done over a few months. At the end of the exercise give a prize to the class that traveled the farthest. Place an odometer outside on school grounds to measure the total miles for the school. If you are also encouraging busing and carpooling, include those modes in this exercise. It is important to remember that children in vehicles can travel far more miles than those walking and biking. To keep the exercise fair to all children, instead of actual miles for motor vehicle trips, add one bonus mile for every trip made by carpool or bus and add it to the total class miles. Have students write a poem or story involving a journey to school. Have them describe the things they see along the way, how it feels to be walking and biking. Have them discuss the safety hazards they may encounter along the way. How could their walk be more pleasant? Assign children to speak with their grandparents (or parents) about their childhood experiences getting to school. Have them draw a picture and write a story about what they learned. Tell them to ask their grandparents how long it took them and what the conditions were like. Have the children write a paragraph comparing how they get to school now with how their grandparents got to school. Find a picture book that shows different transportation modes of the past. Check with your local historical society if this is not available in the library. Take advantage of Internet access through your local library. Take pictures from the book and convert them to overheads or slides or create a PowerPoint presentation using images from the Internet. Start with cave men and women walking, horses, chariots, wagons, and boats. Show how wagons got more elaborate turning to coaches and stagecoaches. Show bicycles (invented in the mid-19th century). Finally, show buses and then cars, starting with an old Model-T and finishing with a newer car. You can also include modern boats and planes. Ask the students to come up with even more modes of travelskateboards, scooters, motorcycles, etc. Have a discussion about the many different ways that people can get around. Which modes are better for their health and the health of the environment? Why dont people walk or take transit as much as they used to? How does that affect their community and the environment? In Marin County, California, instructors gave students a local history lesson about the countys original plan to construct a freeway around Mount Tamalpais and down the coast, and to widen a two-lane road into a major thoroughfare. The plan was defeated in the 1960s by conservationists, environmentalists, scientists and ordinary peopleteachers, parents and even children who fought to preserve Mt. Tamalpais, the coastline, the Point Reyes National Seashore, and rural Marin County. In any community you can find examples of people joining forces to limit development in favor of preserving an area that is valuable as open space. Discuss the successful efforts of many urban centers to reject highways and preserve light rail, such as San Francisco, New Orleans, and Portland. Find a local example of this kind of successful grassroots effort or look to such high profile national projects as the proposed plan to limit auto use in the Yosemite Valley in Yosemite National Park. Locate pictures of the area and enlarge them for a display. Ask the children if they recognize the places in the photos (reveal photos one at a time or have them all on display, mount them or have the students hold them up). Ask the students what all of these places have in common (such as they all have hills, they are all local, they are good places to bike and hike, they are pretty, theres not a lot of pollution, they could be hurt by pollution and development). Ask the class whose job it is to protect these areas now and to continue to make sure that roads and developments arent built in sensitive places (all answers are correct, such as the Park Rangers, the President, but the answer we want is us). Ask how we can do such a big job (answers will include picking up litter and by recycling). The answer we are looking for is that by driving our cars less, walking and biking more, we can help keep these places safe and we wont need as many roads. Stick some strips of adhesive tape onto two or three leaves at different sides of the plant and press them lightly down. Immediately remove the strips of tape taking care not to remove the surface of the leaf. Stick the tape onto their recording sheets, noting the locations of the tape. Back in class, discuss the darkness of pollution on the record sheets. Are roadside ones darker than the ones farthest from the road? Why? Display the results and discuss how pollution affects our lives. This exercise gives students an opportunity to experience the phenomenon of global warming. Clear plastic bottles containing soil and water represent the earth and our atmosphere. The heat lamps replicate the heat of the sun. Students ventilate half of the bottles, allowing the heat to escape, the way heat radiated from Earth before an insulating layer of pollution formed in the atmosphere. The other half of the bottles are left unventilated, demonstrating the way heat is now trapped in our environment, as evidenced by the condensation of moisture in the bottle. Moisture will not condense in the ventilated bottle. Stuff the dirt into the narrow mouth of the bottle, keeping the bottle over the bucket so that the spilled dirt is caught. Instruct the class to get as much dirt into the bottle as possible; about half a cup is good. Pour the water into the narrow mouth of the bottle, making a spout by squeezing the plastic container. Place the tin foil tightly over the mouth of the bottle. Have every other group cut holes near the top of the bottle (three crescent shaped holes about two inches long will work well). Only do this experiment with students who are old enough to use knives. If need be, have helpers make the cuts for them. Explain that every other group will be ventilating their bottles; we will be comparing them to the un-vented bottles. Have all teams place their bottles under the heat lamp and turn it on. Ask who knows what percentage of the earths surface is covered in water (about 75 percent). Explain that the bottles represent the earth because we have a ratio of about three-quarters water to soil (have the students convert the percentage to a fraction). The heat lamp represents the sun and the ventilated bottles represent the earth before the greenhouse effect. Ask the class what they think happens to air pollution. Does it just float off into space? Explain that air pollution stays in the earths atmosphere and has created an insulating blanket around the planet. Explain that the un-ventilated bottles represent the earth now that the pollution in the atmosphere is insulating the earth by trapping the heat from the sun. Tell the students to work as a team to predict what will happen to their bottle under the heat lamp. Record this on their clipboard. Working as a team, ask them to predict what will happen to the earth if heat cannot escape. While waiting for the experiment to happen, hold a discussion on the affects of pollution on the environment. Talk about global warming, air and water pollution, and how cars are a major contributing factor, and that CO2 is a major heat-trapping gas. Ask them how their breathing is affected when walking where there is a lot of traffic. Returning to the experiment, ask the students to observe the difference between their bottle and their neighboring teams bottle. Record the difference on their clipboards. Older children should be familiar with public transit facilities in their region. While Safe Routes to School primarily focuses on walking and biking, adding transit options increases the distance a student can travel, especially when combining bicycling with transit. These exercises give students an opportunity to experience public transportation. Map out a route that will allow students to experience a variety of modes of transit bus, ferry, train, and walking. Create the route with the class. Show the students how to use a transit guide. Use the Internet to learn how to use a transit guide on-line. Invite parent volunteers to accompany the children on the trip. Create interesting destinations along the waymuseums, city hall, a great restaurant for lunch. Use the opportunity to discuss the benefits of using transit. Discuss the trip in class the next day. How did the students enjoy using transit? If they could design a superior transit system how would it work? If your city has bicycle access to transit, create a trip combining bicycle and transit. Ask the students to pick a career that would interest them and then find someone in that career to interview. Have them contact that person and set up an appointment. Using a transit guide, have them map out their route to that appointment using transit. Advise them to map out various means of getting to their appointment, such as a ferry, bus, bicycle, and walking, and then choose the most efficient option. If the appointment is not directly accessible to transit, the student can combine bicycling and transitput their bike on the bus, ferry or train, and then ride to the appointment. Make sure that the student has his or her parents permission to use transit. If the parent is concerned about his or her child riding the bus alone, either have the parent accompany the student or have the students buddy up for the trip. Require the students to write a report or give an oral presentation that describes both the results of the interview and the ride to and from the interview.